Last summer, G and I took a brief trip in August to Italy to visit some of his relatives. It was also a great time for us to indulge in the fabulous food and wine of the region. Here's a recipe I learned at a cooking class I took in Pari, a quaint hill-top town situated in the Upper Maremma of Tuscany. 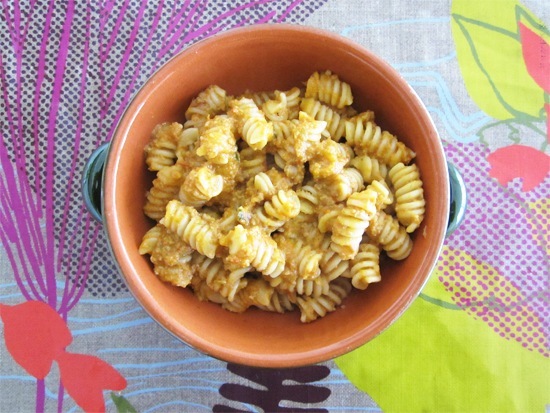 Sugo di Goraiola is a rich pasta sauce made with fresh local sausage*, red bell peppers and mascarpone cheese. There may be other variations found throughout Italy but I learned this particular recipe from two local women, GV and EM. Although G's sister E accompanied me as translator, there seemed to be a common language that we shared when it came down to the act of cooking itself. It was a wonderful cultural exchange and even though we didn't understand each other linguistically, we managed instinctively. This all took place at the Pari community kitchen. 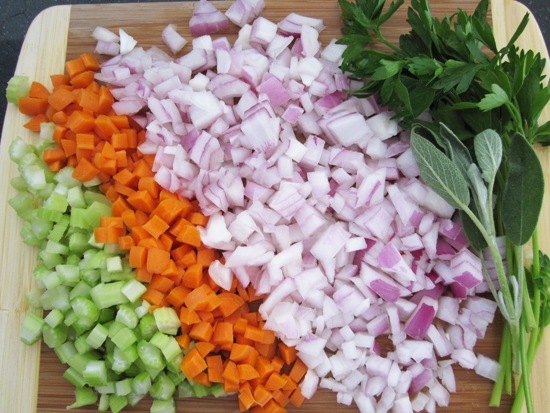 Above is the classic Soffritto (diced onion, celery and carrot) being sauteed and stirred by GV. This was the base for the Goraiola sauce. I learned a couple of other traditional Tuscan dishes such as Ribollita (Tuscan bread and bean soup) and a rustic chicken stew. We meant to make the local specialty Cinghiale (wild boar) stew but there wasn't any fresh boar available. I was happily relieved to get the Italian seal of approval from C, G's niece, the next evening when we served this for dinner to the whole family! Miami markets are abundant with early crops of bell peppers so I'd love to share this decadent dish with you! You can find quality hand-made Italian-style sausage (mild not spicy) at your Whole Foods butcher or local (Laurenzo’s) market. Soy tempeh or a medley of mushrooms would make an excellent vegetarian alternative. Once the sauce is pureed, this is a great way to "hide" the vegetables from finicky little eaters. We substituted half the mascarpone cheese for cream to lighten the texture and served it with rotini pasta like we had in Italy. I hope this becomes a family favorite for you as it has for us. You will need a wide heavy bottomed pot for the sauce, a large stock pot for the pasta and an immersion blender/food processor. This sauce keeps well and may be made in advance or frozen. Serves 8-10 as a 'primo' (first course) Approx. 40 mins. prep and cook time. Heat a heavy bottomed pot on med-high. Turn heat down to medium and add 2 Tbsps oil then slowly saute onions for a few minutes until they become translucent. Add carrots, celery and a pinch of salt and saute for a few more minutes until tender. Add another 2 Tbsps of oil, bell peppers and another pinch of salt then continue to cook down slowly for another 10 minutes. Once the veggies are done, add meat, 2 more Tbsps of oil, red pepper flakes, herbs and cook for about 10 minutes. until meat is cooked through. Add the Brodo (beef stock) and simmer for another 10 minutes to incorporate the flavors. Season to taste. Meanwhile, bring a large pot of salted water to boil for the pasta. Add the cream to the mixture and blend with hand held immerser or carefully ladle small batches at a time to blend in a food processor (make sure to enable steam to escape or else you'll risk an explosion!). Toss gently into hot pasta and serve immediately. Enjoy! There's much to do if you're planning to visit the area. 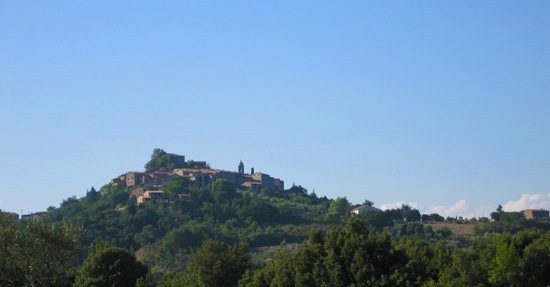 The Casina di Rosa and the Podere Vignali offer accommodations and tours amongst other activities. Check out the courses and workshops offered at the Pari Center for New Learning. The location is ideal for day trips to Siena, Florence, Pisa and many other charming towns that are less travelled. Learn more about the culture and region by visiting this excellent homegrown blog, At Home in Tuscany. Take a tour to the local vineyards to savor this region's exquisite wine, learn authentic Tuscan dishes by taking a cooking class or rejuvenate yourself at the local hot springs and spa. If you travel during the summer months, you might be able to catch a 'Sagra' festival, a traditional food feast with lively entertainment that's held in each town. We had an opportunity to experience the one in Civitella Marittima, another Medieval hill-top town about ten minutes away. The whole area is laced with fabulous restaurants, warm people and a breathtaking landscape! Above is the latest addition to my cookbook collection. At first, I was taken aback by its massive volume. I knew it was going to be an extensive compilation by the Accademia Italiana della Cucina, but I didn't expect it to be a tome of 900 pages! It's on par with The Joy of Cooking and Larousse Gastronomique. 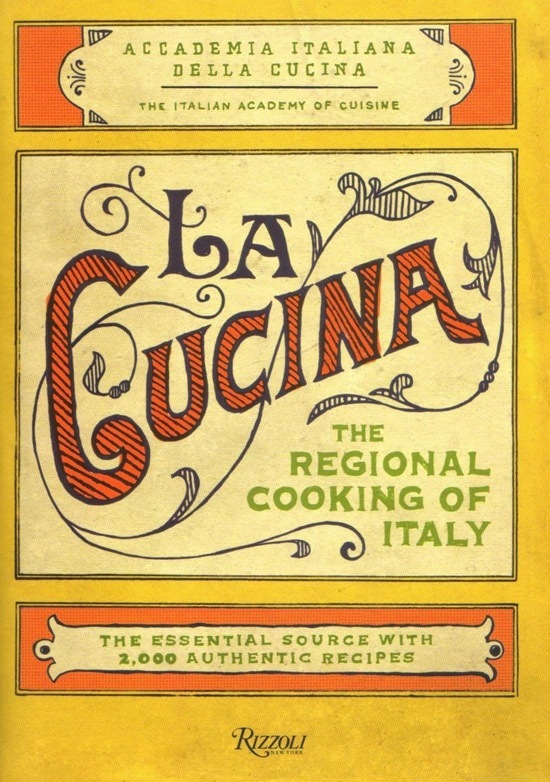 It isn't filled with glossy photos that a typical cookbook would have but it features over 2000 authentic recipes from Italy's twenty diverse regions. This would make a great gift for the serious gourmand in your life! Click on the cover to learn more. * In researching the origins of the Goraiola recipe, thanks to Glo of At Home in Tuscany, I was informed that the local pork sausages of this particular area (the Maremma rather than Tuscany as a whole) are distinct "from other types being that they're only made with cured pork meat, pepper and a bit of garlic; whereas other sausages are made with many other spices. Maremma-style sausages can also be eaten raw. Sausages from a town as close as Pisa will be very different. Thank you for this really nice post and for linking to our vacation house! It looks delicious and totally authentic! Our pleasure Glo, love your new Casina di Rosa site! Discovering the food and specialties of a region is such a highlight for us on our trips. We absolutely love Italian food and can’t wait to get back to savor some more!